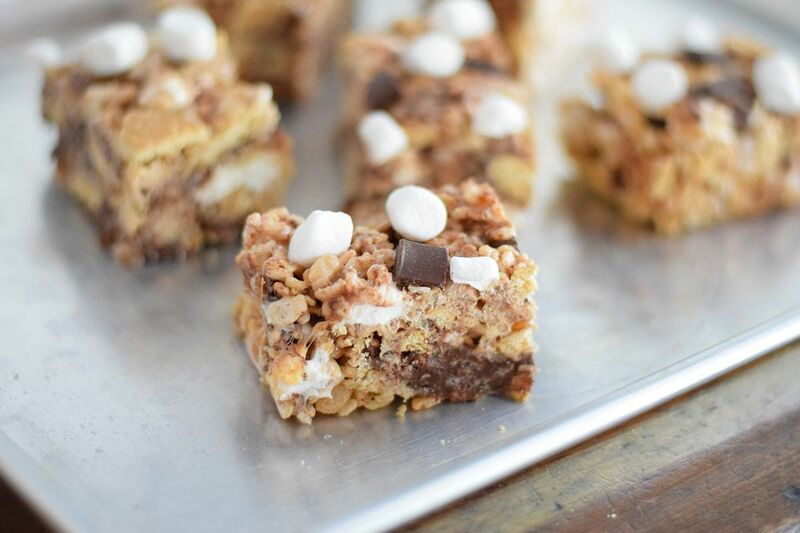 S'more Rice Krispie Treats are bursting with marshmallows, graham crackers, and chocolate chunks. Enjoy all of the best parts of the traditional campfire treat without any bonfire or the ooey gooey mess! These treats can be whipped together in about ten minutes and only require a few simple ingredients. They cool quickly and are ready to serve for your next picnic, barbecue, bake sale, or just for an afternoon snack. You can change the size of the pan depending on what thickness you want the treats to be. If you prefer a thicker treat use a 9x9 pan. If you desire thinner treats use a 9x13 pan. This batch can serve anywhere from 8 to 12 people depending on your appetite! These treats freeze extremely well too. After they have cooled and are sliced, store them in a freezer-safe ziplock bag and place them in the freezer. They will stay fresh and delicious for months! Simply remove from the freezer and thaw for twenty minutes before serving. They can also be stored in an airtight container for 1 to 2 days. Crush the graham crackers into large crumbs or chunks in a ziplock bag or in a bowl. Set aside. Grease a 9x9 inch pan with non-stick spray. Heat the butter in a large saucepan. Make sure it is large enough to accommodate all of the marshmallows. Add the marshmallows to the pan and turn down the heat to low. Stir frequently until the marshmallows have melted. Be careful not to let the marshmallows brown or burn. Remove the pan from the heat and stir in the Rice Krispie cereal, slowly adding a few cups at a time. Allow the mixture to cool very slightly, about 30 seconds to a minute. Stir in the graham cracker crumbs, chocolate chunks, and extra mini marshmallows until evenly distributed throughout the Rice Krispie mixture. If you add the chocolate before the treats have cooled slightly, then the chocolate will completely melt into the treats, changing the look and texture. If you wait too long for them to cool then you will not be able to stir in the chocolate chunks, marshmallows, and graham crackers. Pour the mixture into the greased pan. Lightly grease your hands with non-stick spray and press the mixture evenly into the pan. Press in more mini marshmallows and chocolate chunks into the top of the treats if desired. After the treats have completely cooled, cut them into squares or other desired shape. Store in an airtight container or place in plastic zip bags in the freezer.